The constellation Octans. Roll mouse over to see labels. 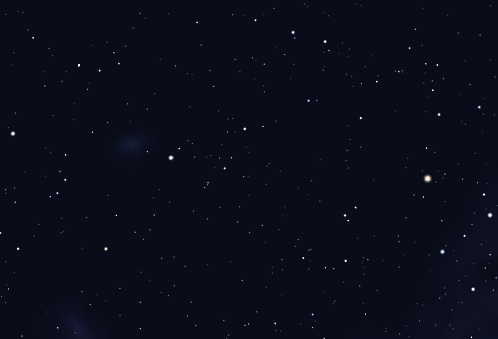 Octans is a faint constellation in the southern sky, most notable for containing the south celestial pole. Whereas the north celestial pole lies close to the pole star Polaris, the south celestial pole lies in a dark area of the sky. Octans contains only one star brighter than fourth magnitude, and there are no stars visible to the naked eye within a degree of the pole. Octans is named after the octant, a compact form of quadrant used for measuring the angles between stars. The name was applied to this sky area by Nicolas Louis de Lacaille in 1756, as one of fourteen constellations which celebrate tools. Lying away from the plane of the Milky Way, Octans contains no bright deep sky objects. 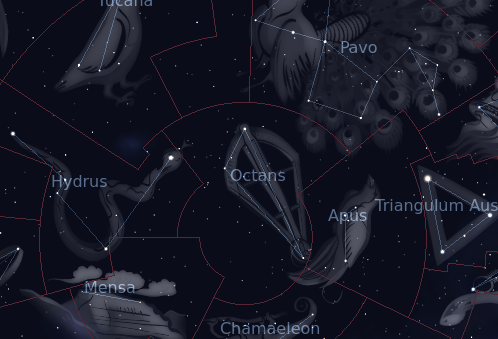 The following constellations neighbor Octans: Apus, Chamaeleon, Hydrus, Indus, Mensa, Pavo, Tucana.